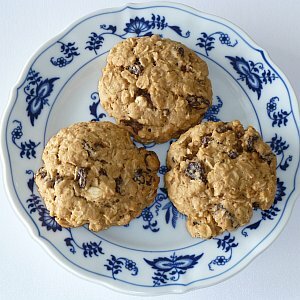 This recipe for Oatmeal Raisin Cookies uses half the sugar and less butter than many other recipes. Nevertheless, the cookies are sweet enough because of the brown sugar and the raisins. Preheat oven to 350°F (177°C). In large bowl, cream together butter and brown sugar until smooth. Beat in the eggs and vanilla until fluffy. Stir together flour, baking soda, cinnamon, nutmeg and salt. Gradually beat into butter mixture. Stir in oats and raisins. Shape the dough into balls about the size of a golf ball, place on ungreased cookie sheets, and flatten to a thickness of one centimeter, slightly less than half an inch. The cookies should be about one inch apart to allow for expansion. Bake approximately 10 minutes in the preheated oven, or until golden brown. Remove from the oven and allow to cool. Transfer to a wire rack to cool completely.